Do you anthropomorphize trees? I do. Can’t help it. Madrones. Redwoods. Maples. Birch. I’m so in love with trees that I’ve named the maples outside my home after my novels. Not sure what will happen when I’ve written the next novel and I’m out of trees. Traveling is great for a writer because it alters your perceptions and perspective. Home is good too, because it grounds those travel experiences. I like to travel and write, then come home and edit. I’ve kept track of where I’ve written every novel. Wild Blue Yonder began on my deck in Lexington and ended here, too, but a lot of it was written at Squam Lake, New Hampshire. A major draft of Madrone was written in Santa Cruz. Much of Bridge Across the Ocean was set, and written, on the island of Magong, off the coast of the island of Taiwan. The entire first draft of Anarchy was written in Port Launay, France (land of revolution and anarchy). Books are made of trees, and one hopes they will be as intellectually sturdy and long-lived as their forebears. Click here to order a copy of your own. Over 650 Vietnam War novels have been published, mostly dark tales from the war zone. In Wild Blue Yonder, Airman Nathaniel Hawthorne Flowers goes not to Vietnam but Germany, straight into a military Catch-22. His assignment: writing stories for the Stars and Stripes newspaper which will never see print. Nate’s adventure deepens as he and his fellow troops try to understand why they’re there, the military mindset, and the massive social disruption roiling 1960s America. 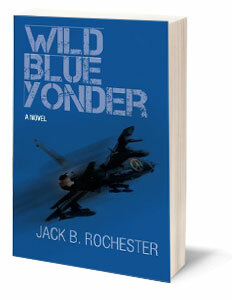 Existential, psychedelic, funny, and laced with rock ‘n’ roll, Wild Blue Yonder is the story of Nate’s quest for personal and spiritual values while learning the meaning of family, friendship, and the love of the girl he left behind.